Driverless cars are definitely not just a possibility, but already exist in the UK. UK were NOT one of the 72 countries who signed the Vienna Convention, which included a clause stating ‘every vehicle or combination of vehicles shall have a driver’. Most of our European neighbours signed obediently on the dotted line which, technically, means they CAN’T develop driverless vehicles. Having said that, the current batch of driverless vehicles are somewhat strange-looking. It’s almost as though the designers felt it necessary to make them stand out from ‘normal’ cars so those still being in full control of their vehicle can give them a wide berth, just in case the on board computer says ‘No’ – or worse still ‘I’m lost’! They range from a futuristic pod (UK Autodrive) set to appear in both Coventry and Milton Keynes (good luck with the roundabouts! 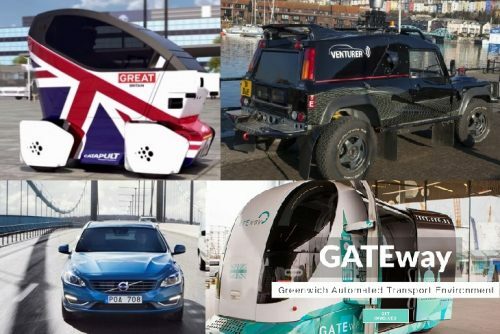 ), the London based GATEway, which resembles a futuristic bubble car, to something that looks as if it has escaped from MadMax (Venturer) and is already tackling the outer regions of Bristol. The most normal looking of the bunch is the Drive Me London project which is partnered with Volvo, but they won’t be on London’s roads until 2018. The question is, do you trust them? Would you jump in one and let it drive you home from the nearest bar? Aeroplanes have autopilot and it’s a bit of a standing joke that the crew are just there to ensure the computer is behaving itself, but their autopilot has several back-ups so if one goes wrong another one simply takes over. There are pros and cons; 45 percent of people surveyed by cheapcarinsurance.net said they don’t trust driverless cars. But when we get rid of humans driving, we’ll end traffic jams, traffic lights and human error. However, the cars currently have a limited reach and speed – so you wouldn’t set out from your home in Milton Keynes to visit your auntie in Dundee – firstly, you wouldn’t get much past the first junction on the M1, secondly, the car probably hasn’t learned the hazards on that route. It’s not quite time to revamp your company fleet and happily catch up on your email and phone calls while your car transports you to your next appointment – but maybe within the next decade this won’t be anything unusual.